This guidance provides the standard of conduct for organizational conflicts of interest related to procurement actions using Federal funds in compliance with §2 CFR 200.318(c)(2). An organizational conflict of interest exists where a financial relationship between the University and an external entity compromises the integrity of institutional decision-making. Due to relationships with a parent company, affiliate, or subsidiary organization, the University may be unable or appear to be unable to be impartial in conducting a procurement action involving a related organization. The intent with this guidance is for the University to provide clear standards aimed at preventing any procurement organizational conflicts of interest from compromising its objectivity in the performance of its responsibilities. Identified procurement activities with affiliated entities of the University on Federal awards and those sponsors requiring Federal standards will be reviewed. The Conflict of Interest Program will be notified of the need for review on these actions. As part of the subrecipient process, subrecipients are required to complete the subrecipient commitment form, and all applicable terms and conditions are flowed down in the executed subaward agreement, indicating compliance where applicable. Review will be conducted under the standards set by Federal regulations and those used by the State of North Carolina. A bidding process shall be required for all situations in which a sole source justification is not necessary. Purchases can be made under N.C.G.S. 143-129(e)(g) which allows for purchases of apparatus, supplies, materials, or equipment to be made using sole-source exception when: (i) performance or price competition for a product are not available; (ii) a needed product is available from only one source of supply; or (iii) standardization or compatibility is the overriding consideration. In addition to these standards, the review may take into consideration other standards as applicable. The review is not intended to replace or bypass the typical University review processes administered by the Office of Sponsored Research, the Division of Finance or other applicable University offices. This review will be conducted by the COI Officer and the Director of Internal Audit or their designees. Documentation of their review will be maintained by the COI Program. A decision on the identified procurement activity will be required before procurement activities will be processed. Research Award Management (RAM) Tracker was created to assist OSR staff and leadership with day-to-day management of proposal and award transactions, by providing real-time visibility of the status of transactions as they make their way through OSR. The RAM Tracker transparency feature enables individuals with access to proposals and/or awards in RAMSeS to view key RAM Tracker information via the Events tab by searching both the Proposal (IPF) ID or Project ID, as outlined below. 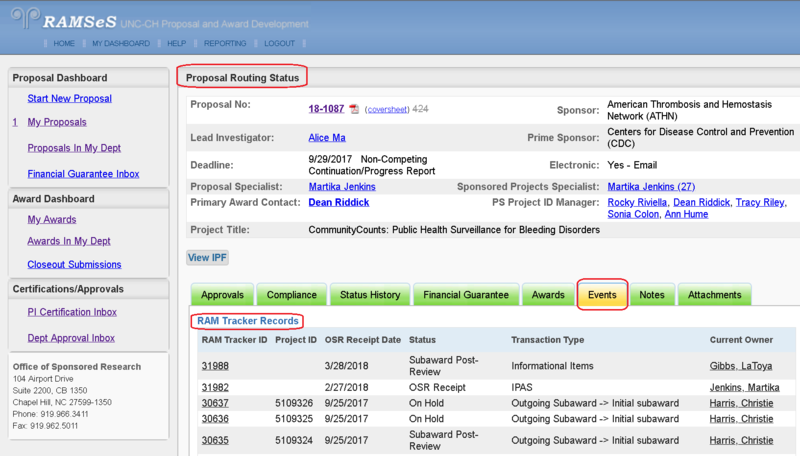 RAM Tracker records are displayed via the Events tab on the Proposal Routing Screen for all proposals in statuses other than Dept Approval in Process, Not Funded, and Withdrawn. Anyone with access to the proposal may view the Events tab and open RAM Trackers. 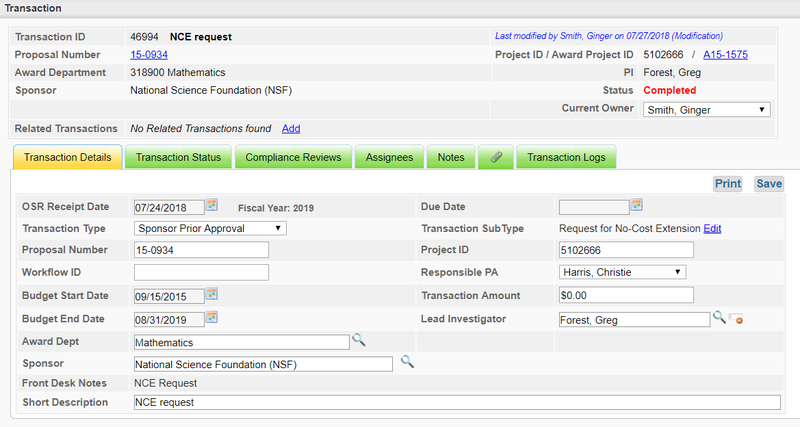 The Project Administration screen is available to anyone with access to the project’s award(s). (NOTE: Individuals with access to a proposal do not automatically have access to its associated awards). RAM Tracker records are displayed for all created RAM Trackers during the project via the Events tab. Non-Financial Agreement – non-financial, binding agreement, such as Confidentiality Agreement, etc. OSR Receipt: A pending award or award-related action has been created and is being assigned to a Sponsored Project Specialist for review. SPS Review: A pending award or award-related action is currently under review by a Sponsored Project Specialist. RAM Review: A pending award or award-related action is currently under review by a Research Administration Manager. SAM Review: A pending subaward action is currently under review by a Subaward Manager. SAS Review: A pending subaward action has been assigned to a Subaward Specialist for creation or amendment. Negotiation: A pending award or award-related action is currently under negotiation between OSR and internal and/or external parties. On Hold: A pending award or award-related action is currently on hold pending action and/or information from a non-OSR party, and the Sponsored Project Specialist can do no additional work until that is resolved. Sent to Data Management: A pending award or award-related action has been fully processed by an OSR Research Administration staff member and has been sent to the OSR Data Management team for final processing. Completed: A pending award, award-related, or subaward action has been fully processed by all work units within OSR. Marked for Deletion: The action was a duplicate or not needed and is pending deletion by a RAM. Compliance Reviews: This tab indicates if that all required and applicable compliance checks have been completed as required by Federal and State regulations. Attachments: These are attachments in RAM Tracker ONLY, these may or may not be the same attachments in RAMSeS for that project. 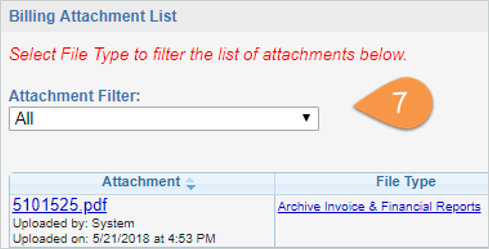 Documents uploaded to RAM Tracker records may be viewed via Project Administration, Attachments tab by non-Admins, Read-Only Admins, and Admins. NOTE: For projects with multiple proposals, RAM Tracker attachments for all proposals are displayed via the Project Events tab. Only RAM Tracker attachments designated with “All Parties” access may be viewed by campus/non-Admins and Read-Only Admins. Use the Attachments Tab in the Proposal or Project Administration pages. The Billing tab also has the Billing Attachment List, which contains the PDFs of all submitted and accepted invoices and financial reports. Please note that if the invoice or report has not been accepted by the sponsor it will not be here. Some agreements may require a progress report to be submitted with, or at the same time, as a financial report. As applicable, please send all completed and signed progress reports to OSRBIlling@unc.edu. For any project specific questions please contact your OSR Sponsored Projects Accountants or email OSRBIlling@unc.edu. 2. Hover over the ADMIN tab and select Award Admin. 3. Enter the PS Project ID. 4. Click on the Project No hyperlink. This will open the Project Administration page. 5. Click on the Billing tab. 6. The first section will provide project specific financial information. 7. Billing Attachment List will list all invoices or reports submitted to and accepted by the sponsor. In support of the University’s mission to expand the body of knowledge and teach students of all levels in an environment of research and free inquiry, the Research Administration Support Group (RASG) will inform, educate, and support individuals involved in research and research administration by providing a forum for discussion and open exchange of ideas and an information network for policies, procedures, and sponsor guidelines. RAMSeS is the University’s official proposal and award management system. All research proposals requesting funding for a grant, contract or cooperative agreement must be recorded in RAMSeS. ConnectCarolina (CC) is the University’s financial administration system. All financial transactions are generated and recorded in this system. To obtain access to CC you will need to contact your department’s Access Request Coordinator (ARC) to complete the correct forms. For more information on how to use CC for Research Administrators, please see CCInfo. InfoPorte is an application platform within ConnectCarolina that allows administrators to view reports for finances, including grant financial management, Core Facilities management, Access requests, budget revision requests for both research and non-research related budgets, and other administrative actions. This system serves as a portal to manage all disclosure and request forms related to Conflicts of Interest (COI) and Commitment. Access is available for any COI disclosure forms, COI training, and or External Professional Activities for Pay (EPAP). ACAP is an online system for submission and administration of the University’s Institutional Animal Care and Use Committee (IACUC) protocols, as well as a tool for ordering animals and making other Division of Comparative Medicine (formerly the Division of Lab Animal Maintenance) requests. 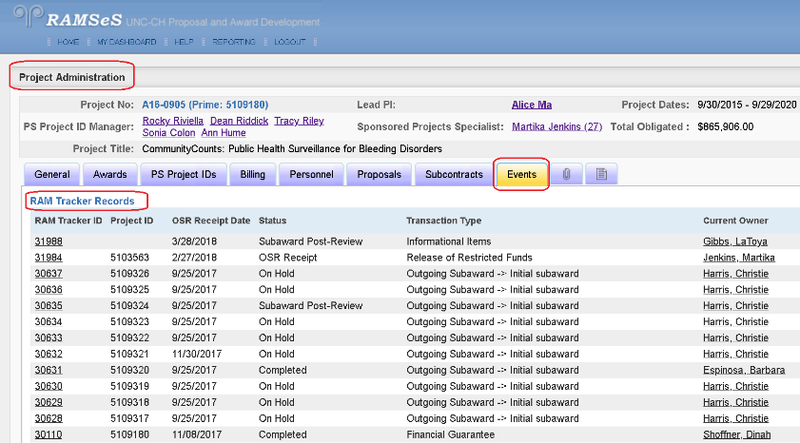 ALICE is an information system for submitting and managing agreements with the Office of Sponsored Research’s Industry Contracting Team and managing clinical trial compliance and billing with the Office of Clinical Trials (OCT). This system database manages roles and access within RAMSeS. It can be accessed via RAMSeS and is hosted by the Office of Research Information Systems (ORIS). This is an information system for entering Reports of Invention and a portal to view the status of all technologies and associated patents and agreements, including Material Transfer Agreements (MTA), under management at the Office of Technology Commercialization (formerly the Office of Commercialization and Economic Development). This system is the repository for all human subject research applications, amendments, and protocols at the University that are reviewed and approved by the Institutional Review Board (IRB) within the Office of Human Research Ethics (OHRE). Click here for the PDF version of the Roles and Responsibilities matrix. Research Service Centers (RSCs), also known as cores or core facilities, recharge or service centers, support the research enterprise by providing researchers and scientists with access to infrastructure, scientific technologies, and services that are normally beyond the technical or financial capability of individual investigators.